Secure. Mobile. Affordable. Powering the New Culture of Work. Today’s Desktop-as-a-Service (DaaS) and the modern workplace is where the demand for greater mobility and productivity meets the demand for greater security and lower costs. To best meet these demands, organizations of all types and sizes are abandoning the traditional, PC-based approach to IT and adopting DaaS solutions. 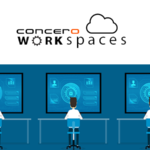 Concero takes DaaS to the next level with Concero Cloud Desktops. It is the best way to deliver business applications to employees at the office, at home, and on the road. Try Concero’s Desktop-as-a-Service (DaaS) for Free! Based in Canada, Concero’s expert support staff are available 24x7x365. You can contact them by email, phone, or via our web portal. Backed by a 99.99% service availability guarantee, Concero’s service desk will ensure your business is always up and running. 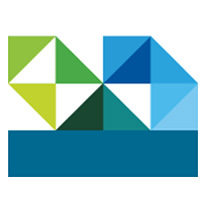 Concero’s DaaS is delivered using a Cloud Desktop. A Cloud Desktop can be used in desktop or application mode and is accessible anytime, from any device. All your current business data will be available whenever you need it. Concero uses the latest Citrix remote desktop and application hosting technology. This technology delivers the best user experience available from any Windows, Apple, or Android device. While most providers sacrifice user-experience by using Microsoft’s less capable and cheaper RDS remote access technology, Concero doesn’t compromise. Concero’s hosted desktops are very responsive, even over higher latency network connections. In fact, the user experience is virtually indistinguishable from desktop PC. To maintain this performance over time, compute resources are scaled on-demand to accommodate more users, applications, and data. Concero gives it clients the flexibility to install any Windows 10 compatible application on their cloud desktop. This is possible because Concero’s provisions a private network and server(s) to every customer. Also, Concero can set granular user policies and permissions to address any special security requirement a customer may have. 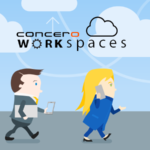 Concero Cloud Desktops are Microsoft Office 365 ready. In fact, we install the full suite of Office 365 applications by default on every Cloud Desktop. To use them, you need an Office 365 ProPlus, E3, or E5 subscription. Concero can also improve security and simplify user management by setting up single sign-on (SSO) between your company’s Active Directory service and Office 365. 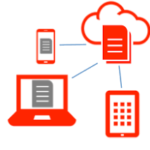 Secure file storage and sharing is a critical component of any business-grade IT solution. Out-of-the-box, every Concero Cloud Desktop comes with its own cloud file storage that can be scaled up as required. It also supports DropBox, Microsoft’s One Drive for Business, Citrix’s ShareFile, and Concero’s own SyncAnywhere file services. Each service has its own unique features that should be considered carefully when looking for greater centralized control and heightened protection from ransom-ware. Learn More about the storage options associated with Concero Cloud Desktops or speak to a sales representative for more guidance. Although the PC remains the dominate device for delivering desktops to employees, this era is ending. For a fraction of the cost, nearly all employee PCs can now be replaced by a micro compute devices connected to a Cloud Desktop in the data center. Concero’s own plug-and-play HUB devices are secured and optimized to deliver a superior end-user experience with Concero Desktops and can be added to your monthly subscription at minimal cost. Learn More. Concero will customize the installation of your hosted desktop to meet your unique business requirements. We’ll work with you and your software vendors to seamlessly migrate your applications and data. Concero /con-cer-o/ Verb [Latin] meaning to join or link together. Concero is a Canadian cloud services provider. We focus on the delivery of cloud solutions that make IT more mobile, more secure, and more affordable. Since 2010, we've worked through partners and directly with public and private sector organizations to deliver enterprise-grade IT solutions. We always strive to be a center of excellence: employing great people, implementing industry best practices, and using world-class technologies. It’d be great to hear from you! 310-1620 Dickson Avenue, Kelowna B.C.